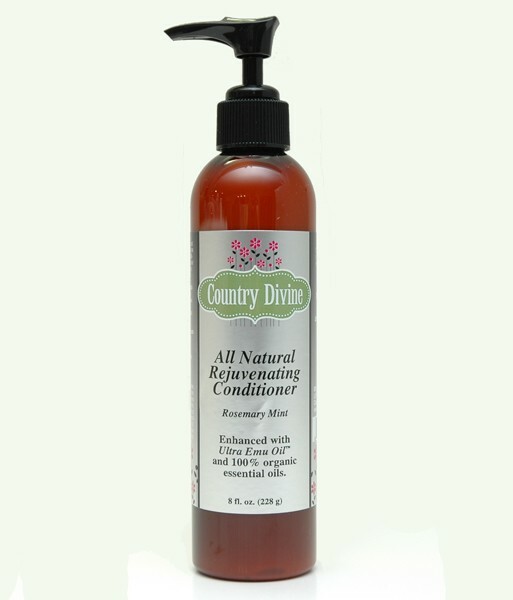 Country Divine All Natural Rejuvenating Hair Conditioner With Emu Oil (Rosemary Mint) 8 oz. Bottle. Emu Oil: Will aid in the repair of damaged hair. Locking in moisture, leaving behind smooth healthy hair. Organic Rosemary Essential Oil: Nourishes the scalp, stimulates hair growth and improves most scalp problems, particularly dandruff and seborrhea. Organic Spearmint Essential Oil: This is an uplifting oil, great for alleviating fatigue and depression. Thyme Botanical Extract: Has astringent properties and can effectively fight germs and prevent inflammation. Chrysanthemum Botanical Extract: This is a natural astringent and skin/scalp revitalizer. Guava Fruit Extract: This is rich in vitamins and helps prevent oxidation. Country Divine's all natural Emu Oil Hair Care Products are made with nature's finest ingredients for healthier, manageable hair. Their deep cleansing shampoo and rejuvenating conditioner are made with the highest quality Ultra Emu Oil® to penetrate hair and deliver lasting, intense moisture so hair looks fuller, feels thicker and stays more abundant. Country Divine's hair care products naturally include essential fatty acids, omegas 3, 6, and 9, which replenish dry or damaged hair and restore hair's natural shine. Take advantage of the benefits of Emu Oil for your hair today.